Sitting down to a dinner table where you are the only vegan (and most likely the only vegetarian) is something of a rite of passage that all of us go through. What’s a lone vegan to do when dining out with co-workers or extended family whose reactions to your food choices will range from ignorance to sarcasm to downright insult? Some vegans respond with a humble “It’s just my personal choice,” and try to move on to a new conversation topic, hoping to avoid the spotlight. Others may launch into a lengthy diatribe about the cruelties of factory farming and the environmental and health impacts of eating meat. Still others may relish the opportunity to debate a table of carnivores about the ethics of our food choices. Instead of seeing the meal as a trial, a fight, or a trip to the seventh circle of hell, there’s another way we can view it: an opportunity to make those around you a little more open to the idea of veg eating. You’re not likely to cause anyone to push back their plate of rib roast and declare they are now going vegan for life, but you can start guiding people down a path of compassion. Before you get started though, it’s best to arm yourself with a few basics facts on what does and does not work for persuading others to see things our way. Psychologists, sociologists and communication experts have spent decades conducting scientific research on how and when people are persuaded to change. Their findings – many of which are counter-intuitive – can help us be much more effective in spreading the vegan message. The animal advocacy movement is notorious for pointing the finger at those who fail to live up to our standards. In the 1980s and 1990s many posters proclaimed “Meat is Murder.” One animal rights t-shirt sports a picture of a cow and the slogan “I died for your sins.” We may find such slogans funny (or true), but studies have consistently found that as non-profits increase the amount of guilt in their messages, their persuasiveness drops (Dillard, Kinney and Cruz 1996; Coulter and Pinto 1995). One reason for this is that most of us think of ourselves as decent people. We do what’s right, and we live ethical lives. When we are confronted with the reality that we are causing someone else to suffer (such as the animal that ended up on our plate), we have two choices. We can admit that what we are doing is wrong, and that it is causing unnecessary suffering and death; but an admittance like that would contradict our belief that we are a good person. The second and easier choice is to find a justification for why our behavior is in fact okay: “animals were put here for our use,” “animals don’t feel pain,” “who cares they’re just animals,” etc. When we feel personally responsible for causing someone else to suffer we automatically start to value them a lot less, which gives us an excuse to not care about what happens to them. (Lerner and Simmons 1966). So lay off the guilt at the dinner table (or anywhere else for that matter). It’s fine to explain how animals are mistreated, just don’t blame your tablemates directly for what happens. Otherwise, your encouragement that they change their food choices is going to fall on deaf ears. People will only doubt their beliefs about eating animals when they find themselves in disagreement with someone who they would expect to agree with, someone who is similar to them. If people perceive you to be very different from them (based on your looks, political beliefs, general lifestyle, etc. ), they’re going to expect you to hold the wrong opinion (Dreu and De Vries 2001). For example, “Why would I listen to a Democrat? They’re wrong about everything!” In order to get people to become open-minded about veganism, try agreeing with them on other topics of conversation. When the topic of veganism eventually comes up, people will already have decided that you’re “one of them” – meaning they will listen more closely to your reasons for being veg. It’s important to avoid a “my way or the highway” approach, as this will turn people off from your message (Jones and Davis 1965; Moskowitz 1996; Stangor and Ruble 1989; etc.). Reiterating a consistent belief such as “we should avoid causing unnecessary harm to animals” is good, but being completely rigid in your viewpoint or demanding that your tablemates accept veganism as the only ethical way to live is counterproductive. Sure we may believe that everyone should go vegan, but decades of communication research suggests that we need to tailor our request to where our audience is now. If they’re nowhere close to being vegan, making a request like that will probably get you nowhere (Bochner and Insko 1996; Sherif, Sherif and Nebergall 1965; Whittaker 1967). Encouraging a partial switch (like cutting back on how much chicken they eat, or adding more vegetarian foods to their diet) will do more good in the short term, and it will also make them more likely to agree to larger dietary changes in the future (Burger 1999, Freedman and Fraser 1966, Schwarzwald, Raz and Zyibel 1979, etc.). Instead of explaining why you are vegan, try asking your tablemate why she is not. Get her to lay out the couple reasons preventing her from being (or wanting to be) vegan. Once those obstacles are out in the open, you can provide solutions to each obstacle. For example if she says “I wouldn’t know what to eat,” you can explain where you do your grocery shopping and what vegan foods you typically eat. A recent study found that asking “Why not?” was more effective than a number of other techniques in persuading someone to say yes to a request (Boster et al., 2009). It should be equally effective in getting people to open up to the idea of going veg. Nick CooneyNick Cooney serves as director of education for Mercy For Animals, spearheading the organization’s vegan advocacy efforts, including its online, television, and other national and international advertising campaigns. He also oversees MFA’s highly influential ChooseVeg.com and MeatVideo.com websites, literature distribution, festival and youth outreach, and the efforts of MFA’s thousands of volunteers around the country. 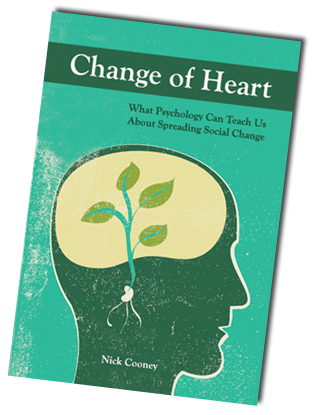 A graduate of Hofstra University, Nick is the author of “Change Of Heart: What Psychology Can Teach Us About Spreading Social Change” (Lantern, 2011) and “Veganomics: The Surprising Science on What Motivates Vegetarians, from the Breakfast Table to the Bedroom” (Lantern, 2014). He has lectured across the U.S. and Europe on effective animal advocacy, and his work for farmed animals has been featured by hundreds of media outlets, including “Time” magazine, “The Wall Street Journal,” and National Public Radio. Nick didn’t grow up with animals and never questioned what he ate until reading Peter Singer’s book “Animal Liberation” at the age of 18. He went vegetarian right away, and vegan a few months later. Nick also immediately got involved with animal advocacy. A semester spent working in rural Mexico and a pair of speeches by powerful animal rights advocates led Nick to conclude that he could do the most good in the world by focusing his life on helping animals. A frequent lecturer who has spoken to hundreds of classrooms, community groups and conferences, Nick is available to speak to your advocacy organization about key psychological principles that can make you more effective in your work for social change. Nick’s talk includes a powerpoint presentation, discussion, and strategy session about how to incorporate these principles into your advocacy work.